The Hibernate Many to One Bidirectional Mapping Annotation Example tutorial shows you how to use Hibernate Many-To-One Bidirectional mapping using annotation based configuration. The Many-To-One Bidirectional mapping said that one table has a foreign key column that referring the primary key of associated table. 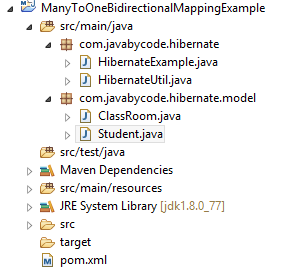 In this Hibernate Many to One Bidirectional Mapping Annotation Example , we will create java project with final directory structure. @OneToMany on students property says that one ClassRoom can have multiple students. From these students we can navigate from ClassRoom to Student. The mappedBy attribute indicates that it’s the inverse side of relationship. It means that multiple students are belong to one classRoom. Thank to the cascade attribute, all Student objects will be persisted/updated/deleted automatically on subsequent persist/update/delete on ClassRoom object. We will create main class to demonstrate this Hibernate Many to One Bidirectional Mapping Annotation Example. In the above code, you can see that we have updated only classRoom explicitly. But thank to the cascade attribute that is set to all on students property of ClassRoom, so that all student objects will be saved on persisting ClassRoom object. That’s it on the Hibernate Many to One Bidirectional Mapping Annotation Example tutorial. Seriously….this is a important web site. Thanks for sharing your thoughts about Hibernate Many to One Bidirectional Mapping Annotation Example. I am truly pleased to glance at this web site posts which includes lots of helpful information, thanks for providing these data.